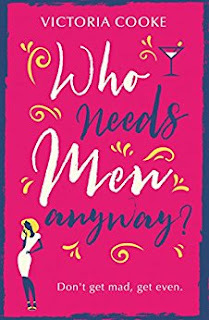 Jessica's Book Biz : Blog Tour - Who needs Men anyway? Blog Tour - Who needs Men anyway? Don't get mad, get even..
Getting even is one thing, but what about getting happy? I was looking forward to reading this as I am a fan of Victoria Cooke's books and I have to say I think this is her best book yet! I absolutely loved this one it was so fun and I really enjoyed it. I really couldn't put it down it was so exciting so much drama. There are loads of characters in this book and it is so easy to love them all. It was really great to see how Charlotte changed from when we first meet her at the start of the book she is definitely a different woman by the end of it. I also enjoyed the friendship circle in this book and how they got through things together and just had fun. Even though you think you know what way the plot is going to go there are loads of little twists and surprises throughout which really kept you reading and guessing just how it was going to end. Such a beautiful, heart warming fun read! One of my favourite books of the year!